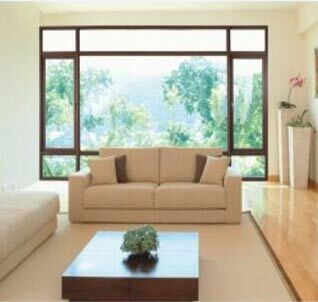 Most of us would agree that homes with large windows and doors have a certain appeal to them. They make the homes look more desirable and grand. In fact, large windows perform a brilliant job of - letting sunlight into homes, providing visual access to outdoors, allowing in fresh air and helping air circulation - the very reason that led to invention of windows in the first place. Having said that, take a look at your old windows and doors. Traditional wooden windows (and doors with glass) require cross members to support their frames due to their lack of inherent strength and thus hinder both the view and the sunlight. Strong steel reinforcements are tucked inside large UPVC frames. Creates positive energy inside the home and makes you feel upbeat. Abundant sunlight also allows you to forgo electrical lighting thus saving on your energy bills. Psychologists believe there's nothing more therapeutic than the wonderful sights of nature forming on your window and glass doors. It helps boost your mood and make you happy. During winter days, well designed large windows and doors can help keep your home warmer, providing you with a cosy warmth you so desire.